This is the end of the Common Man Tour '07 - 300 Miles of History. you can always review it and we now do programs on it. Check our speakers bureau on my webpage at www.RogerFulton.com. But also check out our newest Blogs for Northern New York and Florida. 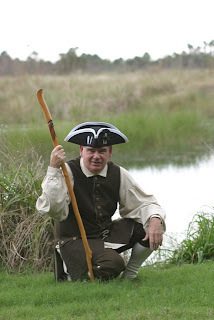 http://rogerstrailsandtales.blogspot.com and http://rogersfloridaoutdoors.blogspot.com Both contain great outdoor information. I guess I fell asleep? The last I knew I was floating down the St. Lawrence River in New York. 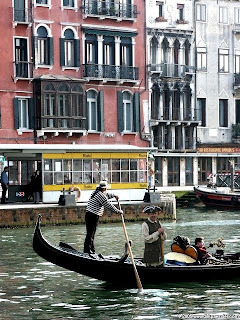 Then I'm in this gondola somewhere! Actually this photo, submitted by Ann West, is a great way to get your attention. So many of you have had such good a time reading this Blog that we are going to continue it. It'll change topics and be geared more toward nature, hiking, biking and all the other things we do. We'll try to keep it interesting and new so that every time you check in you'll find something new and interesting. Thanks for all of your time, attention and please keep tuning in. Yes, we completed the Common Man Tour - 300 miles of history at the Rogers Island Visitors Center in Fort Edward on September 21st, 2007. An all-new Powerpoint program about what we found on our trip was very well received by another packed house. Thanks to all who supported us on this wonderful adventure. 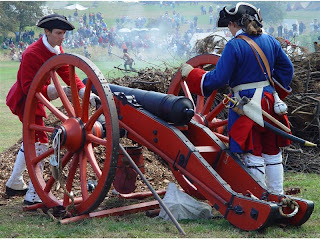 We conducted at least 8 formal programs on the French and Indian War - The Basics, to more than 250 attendees. We conducted dozens of one-on-one discussions with groups or individuals all along our travels. We passed through 10 canalway locks, and traveled on two major rivers, two lakes and several bays and tributaries in our travels. And it was made possible only through the work and generosity of more than 50 support people. Altogether they logged more than 5000 miles on their vehicles during the tour. What's next? Keep posted as we decide in the next couple of weeks. Okay, those of you who have been following this Blog know that we have explored the Hudson River, the Champlain Canal, Lake Champlain, Lake George, the St. Lawrence River, South Bay and the LaChute River over the past three months. So what did we find; and even better, What did we learn over our trek of nearly 300 miles of history? Find out at our final scheduled presentation this Friday night, September 21st. A brand new Powerpoint presentation will document our travels, interspersed by personal accounts of the events and people we encountered along the way. Please join us at the Rogers Island Visitors Center in Fort Edward, NY at 7 pm on Friday night, September 21st, 2007. Thanks for tuning in and we hope to see you at Rogers Island. Photo above by Ann West at the Siege of Fort William Henry on September 15th,2007. So I did my presentation at Waddington and I saw someone bring out refreshments. I announced that there was food, a perfect ending to my presentation. Then i was presented with this cake. Alicia Murphy and her cohorts had conspired to give me an early birthday tribute. True Northern Hospitality. Can't understand though what the 60 means. I think I'm only 39! Thanks to Alicia and her Waddington team! And here is a photo to prove it. But please go to the next entry to see what Northern Hospitality really means. This lighthouse marks the point at which the Oswegatchie River enters the St. Lawrence River at what is now Ogdensburg. That peninsula is where the original French trading post, settlement and fort known as Fort La Presentation once stood. That location is steeped in French and Indian War history and steps are underway to rebuild the fort at that location. I'm an outdoor writer and speaker. I enjoy sharing my outdoor experiences with others through our regional trail guides. Please stay tuned for new info, guides and ecotours.